For last few months this has been all I've been working on and it is finally on a state that it can start to be used by other people. This is going to be a slightly technical post, since the very concept of an API is technical, but for those that are not familiar with the term this means that now the Bratabase information is accessible by third parties so they can build services. This API lives on https://api.bratabase.com and is a JSON web API. I created a parallel site dedicated to its documentation and other technical details. 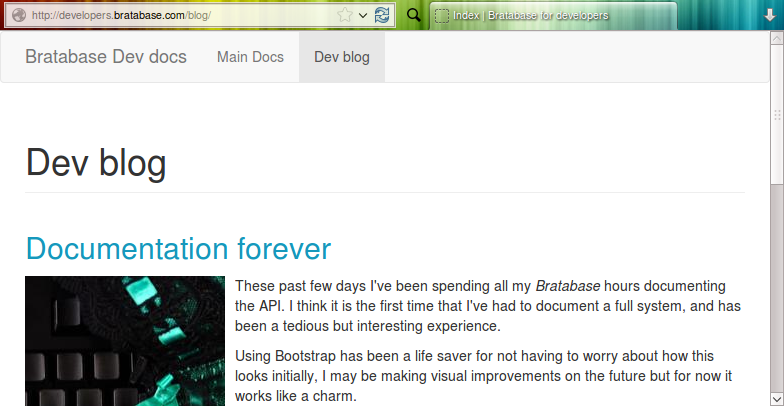 It is http://developers.bratabase.com/, so that should be your first stop to get your feet wet (You must have previous web programming knowledge). Need a list of bra brands, models, etc? If you ever wanted to make a tool or a site that needs to gather a list of bra brands, models, their size ranges, equivalences, relationships and more. Now you have this API available to make use of the database that we have collected over the years. For you, for free, to use! Parties that consume the Bratabase API do not have access to your personal data. They have access to the bra directory. That is, brands, models, sizes. An application can ask you to grant them access to your personal information such as your profile, or bras so they can do interesting stuff with this. Imagine you go to a store, authenticate with Bratabase and now this store knows which bras you have tried already. This is exactly the same flow as when you authorize a Facebook app or a Twitter application. If you have used Twitter or Facebook apps, you have probably visited this page where you can see all the applications that you have granted access to. We've done the same thing here, you can manage your authorized applications. The link is on your Profile. I created a sample application to show how other sites can benefit and use your information after you have granted them access. Since the site now provides a programmatic API, I created a Github organization for Bratabase where I will be sharing code samples and libraries to be used with the API that Bratabase exposes. For instance, the code for the demo Bratabase connect is available on Github. There is also an Authorization Backend for Bratabase to use with Django social auth. I created a separate blog to ramble about technical aspects of the site's development as well as to make public announcements of any change to the API that may happen. I will try my best to keep the documentation always up to date but it is a good idea if you keep an eye on the new dev blog. This API is far from finished, it just has the basic browsing features but there is more stuff to come. Search facilities, size conversion, measurements, etc.